Thanks to staff and volunteers, the playgroup tent at Coppice Day, was a hive of activity and creativity. Dream catchers were woven and clay boggarts emerged from the earth. 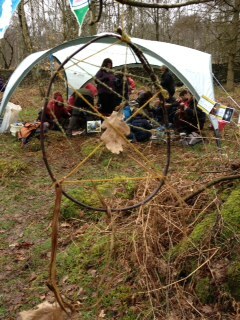 The event is run by Transition Hope Valley and the National Trust. Both organisations have provided input into playgroup over the past year, and I am hugely grateful for it! It was an absolute pleasure, to be able to be part of this special time. Knicker-pecker stools, heather brooms, stories, delicious food and lovely company all went to creating a really great day. When I asked my children which part of the day they had enjoyed most, my three year old replied the toilet! And indeed the compost loo was a pleasure to use! Highly recommend the whole event for next year! This entry was posted in Events on March 4, 2014 by grindleford13.